Black Vinyl 45 consists of long time Shasta County residents with a passion for rock and roll music. With the original goal of creating entertaining events for family and friends, Black Vinyl 45 has grown into one of Shasta County's most sought after local bands. It is the goal of Black Vinyl 45 to create an evening of entertainment that engages the audience by performing recognizable songs that encourage singing and dancing...preferably both. 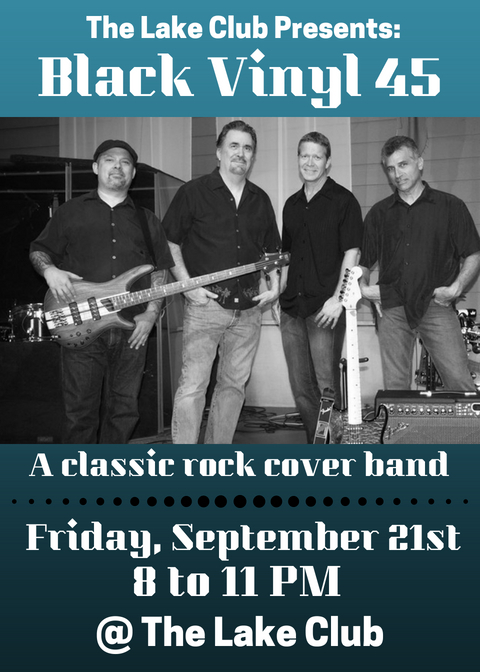 Invite your friends and family down to The Lake Club this Friday night and enjoy live music at its finest. As always, music at The Lake Club is free and open to all residents and guests accompanied by residents.